Did Hurree Jamset Ram Singh feature in any of them? Hurree Jamset Ram Singh, nabob of the fictional state of Bhanipur, you mean? No nabobs figure in The Laughing Corpse, but I have something over two hundred more to read before I can make any definitive statement. Then everything is so wonderfully plentiful! I had to look up Hurree Jamset Ram Singh to learn who he was. I'm not up on my nabobs, I'm afraid. You should browse the Blaft Web site. 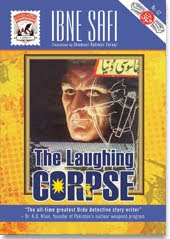 Some of the Indian crime stories share certain features with English and other crime stories. Others do not. TCK, I'm less familiar than some readers will be with English colonial-style thrillers. I will say, though, that a colonial-style thriller from the pen of one of the colonized rather than the colonizers is bound to be of interest, and I don't mean just for political-correctness reasons, either. Such a book is bound to induce reflections on what the Indians absorbed of English culture and made their own. This need not be restricted to cricket. The books carry a blurb from Agatha Christie to the effect that there us just one original mystery writer, Ibne Safi. I'd be interested in knowing what she meant by that. TCK, I bought one of the Flashman novels today, This may be my introduction to English school stories and their descendants. Hurree Jamset Ram Singh does not appear in Ibne Safi's novels. Who's the colo(u)r consultant for that website, Mohammad? could make an interesting case for Ibne's intrepid sleuth! Thanks, Mr. Hanif, though I suspect the questioner may have been joking! I dunno about that, TCK. One man's gaudy is another's vibrant, celebratory and scintillating. Im looking for the jasusi dunya collection paperback, does anyone know where i might be able to find these incredible novels in URDU. I am willing to buy all novels in hindi written by ibne safi will pay good money including shipping cost. I want to read all. Am off to cruise Blaft Publications website..
My pleasure. I think Blaft is raising its profile again, so the timing of my repost may be good.